The instructions below will show you how to make a foundation row and a single crochet stitch. If you follow them exactly, you'll complete a 7" by 9" block, which will be great practice and help a good cause: Warm Up America! 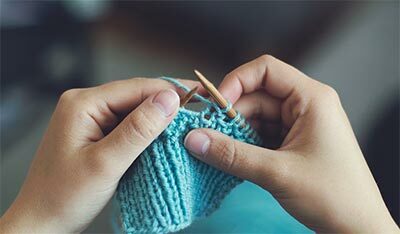 Learn how your block can be joined with others to create an afghan to warm up someone in need. Step 1: Hold crochet hook in right hand and make a slip knot on hook. Step 2: Bring yarn over hook from back to front and grab it with hook. Step 3: Draw hooked yarn through slip knot and onto hook. This makes one chain stitch. Repeat Steps 2 and 3 in sequence 28 more times. You should have 29 chain stitches and one loop will remain on hook. Step 4: Skip the first chain stitch. Step 5: Insert hook into center of next chain stitch. Draw yarn through the chain stitch and up onto the hook. There are now 2 loops on hook. Step 6: Bring yarn over hook from back to front, and draw it through both loops on hook. One loop remains on the hook, and you have just made one single crochet stitch. Repeat Steps 5 and 6 in each of the remaining 27 chains — be sure to work in the very last chain. You have now completed one row of single crochet. Measure your work; it should be about 7" wide. If it is too wide, try again with fewer beginning chains. If it is too narrow, try again with more beginning chains. Step 7: At the end of the row, make one chain stitch, then turn the work counter-clockwise, leaving the hook in the chain. Now you can begin another row, working into the stitches of the previous row. Step 8: Make one single crochet stitch in first stitch and in each remaining stitch of the previous row. Be sure to work into the last stitch. Chain 1, turn. Repeat Step 8 until the block measures 9" long. Finishing: Cut the yarn from the skein, leaving a 6" end. Draw the hook straight up, bringing the yarn through the remaining loop on the hook. Thread yarn into yarn needle and weave back and forth through stitches to secure. 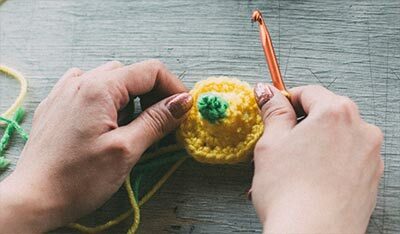 For more crochet instruction, information, and fun things to do with your crocheting, go to the Getting Started page for a list of helpful books, videos, CD-Roms, and web sites. 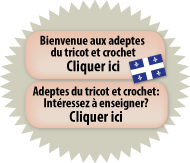 Also visit the Crochet Guild of America site, which also can be accessed by clicking on Guilds from the Getting Started page.